Before the novel and the film Deliverance appeared in the early 1970s, any outsiders one met along the Chattooga River were likely serious canoeists or anglers. In later years, untold numbers and kinds of people have felt the draw of the river’s torrents, which pour down the Appalachians along the Georgia and South Carolina border. Because of Deliverance the Chattooga looms enigmatically in our shared imagination, as iconic as Twain’s Mississippi and-or maybe Conrad’s Congo. This is John Lane’s search for the real Chattooga and-for the truths that reside somewhere in the river’s rapids, along its shores, or in its travelersâ€™ hearts. At the end of his run, Lane leaves us still fully possessed by the Chattooga’s mystery, yet better informed about its place in his world and ours. 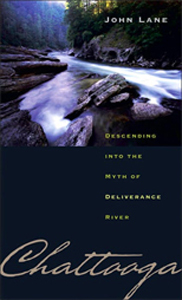 This extended personal narrative by poet and author Lane (Waist Deep in Black Water) focuses on the Chattooga River, which runs along the border of Georgia and South Carolina. Having previously explored the river, Lane returns to journey the entire length of it, describing its natural beauty and danger as well as pausing to view it through the prism of Dickey’s book. In the best parts, Lane artfully applies his poetic sensibility to the river itself… Lane’s own writing and observations are good enough to stand outside of Dickey’s considerable shadow.